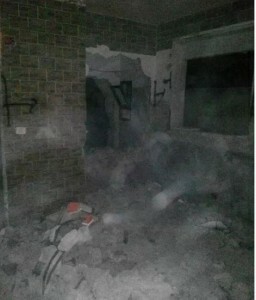 Israeli soldiers invaded, on Wednesday at dawn, Qalandia refugee camp, north of occupied Jerusalem, demolished one home and injured at least eight Palestinians, including three with live fire; one of the wounded was among the abducted residents. 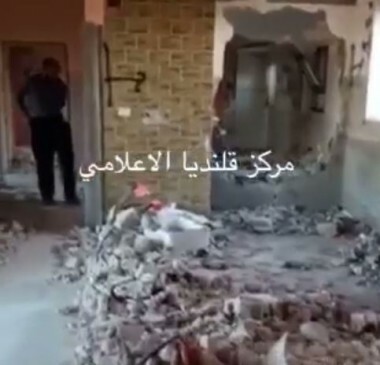 The soldiers surrounded the home of Hussein Abu Ghosh, 17, forced the family out and demolished the property’s inner walls, rendering it uninhabitable. Abu Ghosh was killed by the army, along with another Palestinian on January 26, 2016, after stabbing an Israeli settler woman to death. The second Palestinian, who was also killed in the same incident, has been identified as Ibrahim Allan, 22. The attack took place in Beit Horon Israeli colony. The Abu Ghosh family home is on the third floor of a four-story building inhabited by Allan’s father, and his six brothers. The invasion into the refugee camp was carried out by more than 40 armored vehicles and a military bulldozer. Local sources said the soldiers also kidnapped a young man, identified as Hasan Sajdiyya, after shooting and injuring him. Medical sources said the soldiers shot three young men with live rounds, and five others with rubber-coated steel bullets, while dozens of Palestinians suffered the effects of tear gas inhalation. Israeli military sources said two soldiers were injured during the clashes that took place in the refugee camp, after some protesters hurled a homemade explosive on an army vehicle.